Affordable matte lipstick color pay off that’s been right under your nose the entire time. I mentioned last week about my love affair with HOT PINK. 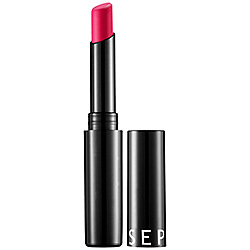 It has not wavered Although I may have found a good dupe for Nars Schiap, I still wanted some major bright pink lipstick in my life. And I had a gift certificate, so after a ton of online research (thank me later) I settled on this one by Sephora. I was deciding between this color and Forever Fuchsia, I don’t actually know what Forever Fuchsia looks like IRL, but I am pretty seriously happy with my choice. While its not as bright or light hot pink as Nars Schiap, Basically I dig it. Overall, the color is a darker than the Nars Schiap and has a bit of a florescent undertone (don’t be scared, I am probably the only one who has noticed). The color is matte, which I love, but is totally NOT drying at all. I sometimes find Nars to be a bit too drying (but the amazing staying power cannot be denied so take it or leave it). The color really wraps my lips, and stays. And when it does fade it does so in a way that is not hideous or unappealing. The color is basically if HOTPINK and RASPBERRY had a love child- that is the kind of pink we are talking about. Its no so berry that you are limited to wearing it in Fall/Winter (but rules be damned in general) and its not so HOTPINK that you can’t wear it unless you have a tan. Its hits the perfect middle ground and its twelve bucks. Can you handle. They may not be certified green, but sometimes I have to look the other way, the color pay off is just too much fun.